Mons. Hilary Franco, Alessandra Moia PhD, Prof. Antonino De Lorenzo, Prof. Franco Salvatori, Cav. Anthony Brusco, Orlandino Greco, Prof. Fabio Parasecoli, Cav. Josephine Maietta, Elisabetta Calello, and Peter Caruso. Antonino De Lorenzo, Elisabetta Calello, Joseph Scelsa EdD, Alessandra Moia PhD, Cav. Josephine Maietta, Cav. Peter Caruso, Orlandino Greco, and Anthony Brusco. 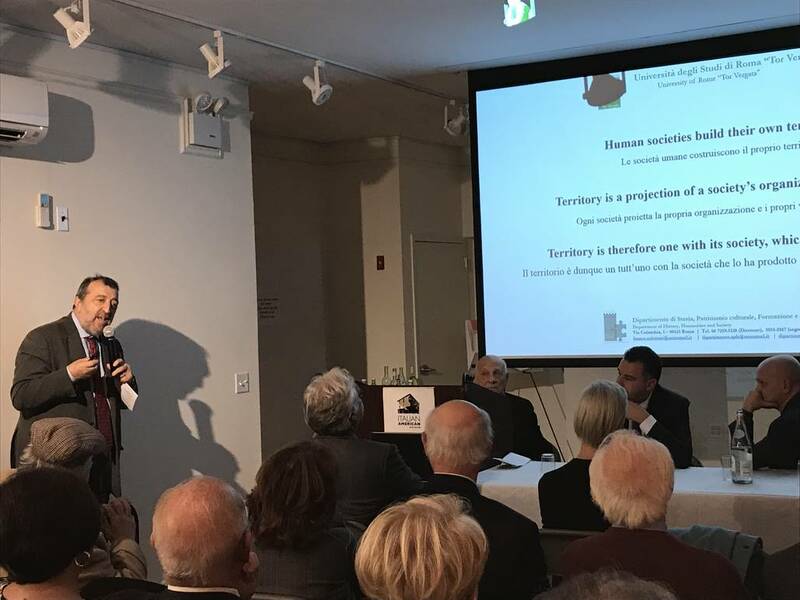 Little Italy’s Italian American Museum hosted a seminar on “The Mediterranean Diet: Present, Past and Future,” featuring presentations by experts on the subject. 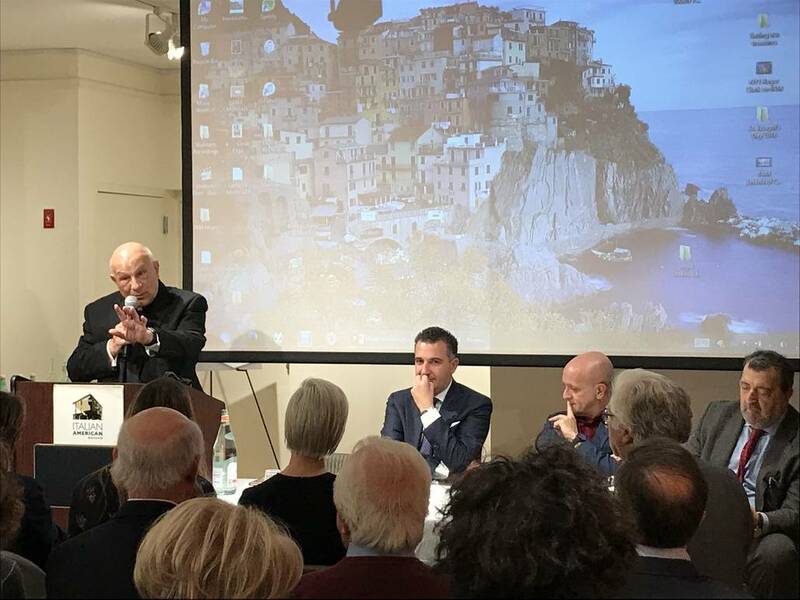 The seminar occurred on the heels of the passage of a new law in Calabria that looks to promote the Mediterranean Diet in relation to Nicotera, the birthplace of the Diet. The Mediterranean Diet is scientifically proven to be one of the healthiest dietary regimens in the world. In fact, as of 2010, the Diet was given UNESCO’s Intangible Cultural Heritage recognition. On Wednesday, November 15, those interested in the history, benefits, and future of the Mediterranean diet gathered at the Italian American Museum to hear a series of presentations on the topic. 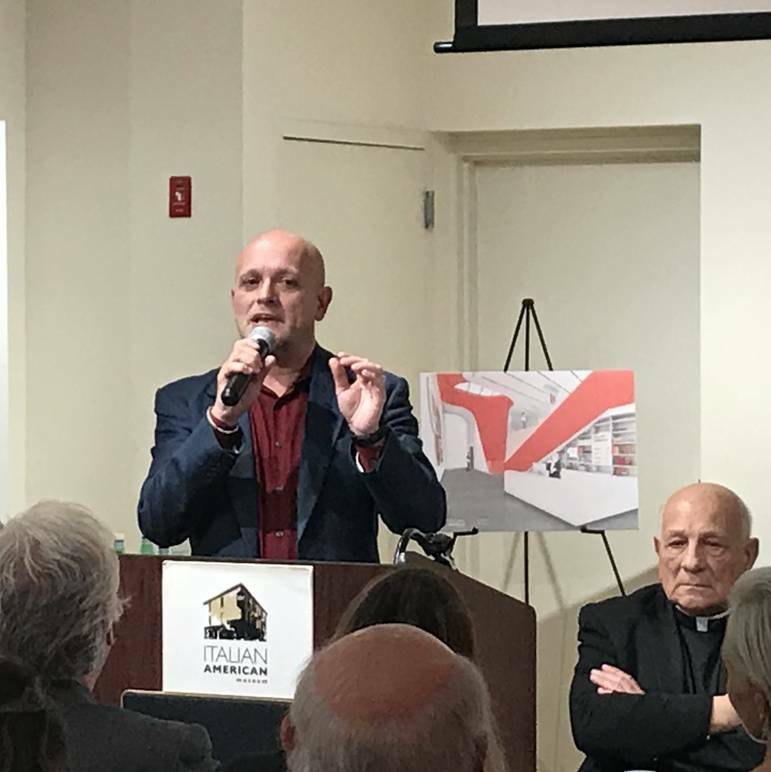 Joseph Scelsa, founder and director of the Italian American Museum, welcomed guests and spoke a bit about the Museum’s plan for a new space. Following Scelsa’s welcoming remarks, Monsignor Hilary Franco, Holy See to the United Nations, introduced himself and the speakers for the evening: Orlandino Greco–Councilor Regione Calabria, Antonino De Lorenzo–Director of the School of Specialization in Clinical Nutrition at the University of Rome Tor Vergata, Franco Salvatori–Dean of the Department of Literature and Philosophy at the University of Rome Tor Vergata, and Fabio Parasecoli–Director of Food Studies at The New School and an expert on food culture and geopolitics. The gathering that evening was thanks to the hard work Alessandra Moia, who organized the seminar. The Mediterranean Diet has its roots in the city of Nicotera, region of Calabria. Nicotera was the base for the “Seven Countries Study” (1957), which documented the occurrence of chronic degenerative diseases in across seven countries: the United States, Italy, Finland, Greece, Yugoslavia, the Netherlands, and Japan. The data from Nicotera showed an extremely low rate of heart attacks; it also revealed a low occurrence of high blood pressure, diabetes, and obesity. As a result, it became the Dieta Mediterranea Italiana di Riferimento–the reference point on which the Mediterranean Diet is based. The original study was subsequently confirmed by studies from the 1960s-1990s by Prof. Alberto. Fidanza and from 1990-2010 by Prof. Antonino. De Lorenzo. 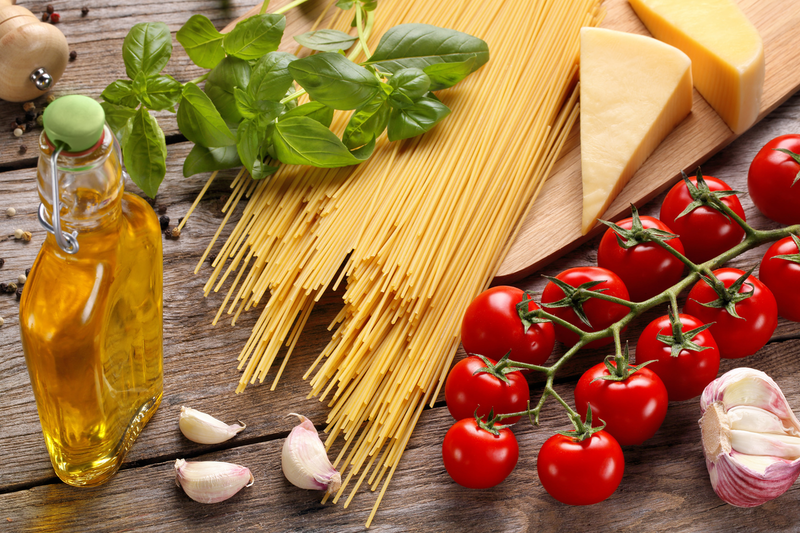 On October 31, the Regional Council of Calabria approved a law for the promotion of the Mediterranean Diet. 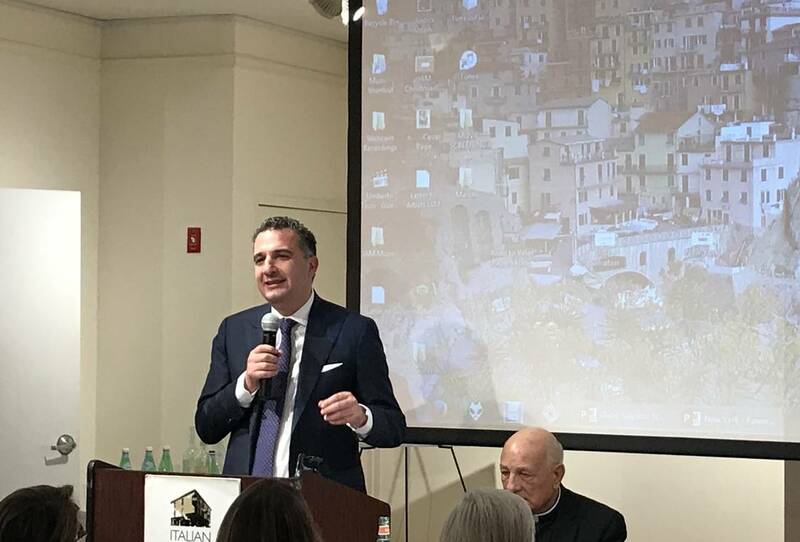 The Councilor of the Regione Calabria, Orlandino Greco, came to the Italian American Museum on Mulberry Street to talk about how such a law could positively affect the region. “From 2016 data, Calabria’s exports are 0.1%. Despite production, despite the quality of our products, despite everything, the exports are still 0.1%. This is probably because we have never had a brand that promotes these products abroad.” He went on to say that the Mediterranean Diet must be valued because it could be a unifying factor for the region with the possibility of boosting exports and, as a result, tourism. To speak about the health benefits of the Mediterranean Diet was none other than Antonino De Lorenzo. He began by explaining the original study on the Mediterranean Diet conducted by Ancel Keys in Nicotera, which was part of the larger Seven Countries Study. The results revealed how the the cohort of people living in Nicotera, Calabria followed a diet, which lead to a reduction in chronic degenerative diseases. The study also revealed a correlation between certain kinds of fats, polyunsaturated and monounsaturated, which are an important part of a balanced diet. In terms of percentages, De Lorenzo stated that the Mediterranean Diet reduces the occurrence of chronic degenerative diseases by 30%. However, to better understand what that means, it helps to look at Ancel Keys’ “Mediterranean Diet Index.” The guiding principle behind the Index is that the intake of certain foods reduces the mortality rate. For every 2.0 points on the Index, mortality is reduced by 8%. Over the years since the initial study, the dietary habits of residents of Calabria had shifted. The diet of the 1960s had consisted mostly of fruits, vegetables, wheats, cereal, potatoes, and nuts with limited consumption of red meats and refined sugar. The Index at that time was anywhere from 7.2 to 10.0. As the food industry continued to grow, a reverse dietary shift subsequently occurred, and by the 1990s, the Index decreased to 2.8. Calabria was previously the region with the lowest incidence of obesity, but it since became the region with the highest occurrence of obesity. This is one example of the inverse relationship between chronic degenerative diseases and the Mediterranean Diet Index. Franco Salvatori was next to speak and offered insight that was both scientific and philosophical. As the land and the society that inhabits it are inseparable, Salvatori highlighted the importance of being connected with the land. He stated, “The structure of a territory is functional with respect to the structure of the society. The territory is organized to guarantee the health of the society.” In the case of the Mediterranean Diet, it is evident that the territory has a positive effect on its residents. Nicotera became the reference point for the Diet, and the origins of its residents’ food choices is what proves Salvatori’s point. The Mediterranean Diet began as a result of frugality. People lived off the land because it was the only option they could afford. Grains, legumes, vegetables, fresh and dry fruit, extra virgin olive oil, and fish were the foods of choice by residents in Nicotera. Nicotera is a perfect example of the interaction between land and society. Although these ingredients are of the land, “food” is a product of culture. We choose the way in which we use these raw materials to make a finished product. These choices, in turn, influence the both agricultural landscape and the landscape as a whole. All of this serves to demonstrate the interconnectivity between the Earth and society. Salvatori concluded by stating how each society represents itself by the landscape it chooses to have, and despite trends towards standardization and homogenization, Italy’s landscape remains varied because its aesthetic value is considered important. In order to understand the dietary shift that occurred in Calabria, Fabio Parasecoli touched upon the reasons for and the significance of a change in dietary regimens across the globe. The shift from a plant-based to a meat-based diet began in the 20th century in the United States, but it has since been spreading across the globe. In addition to an increased amount of meat in people’s diets, we’re also seeing an increase in fat content and in the number of processed foods consumed. Shifting to this type of diet is often viewed as progress, and we’re now seeing two of the most populous nations in the world, India and China, making this shift. Moving forward, the challenge will be creating a language to convey to people, both in Calabria and outside of it, the richness that the region has to offer. 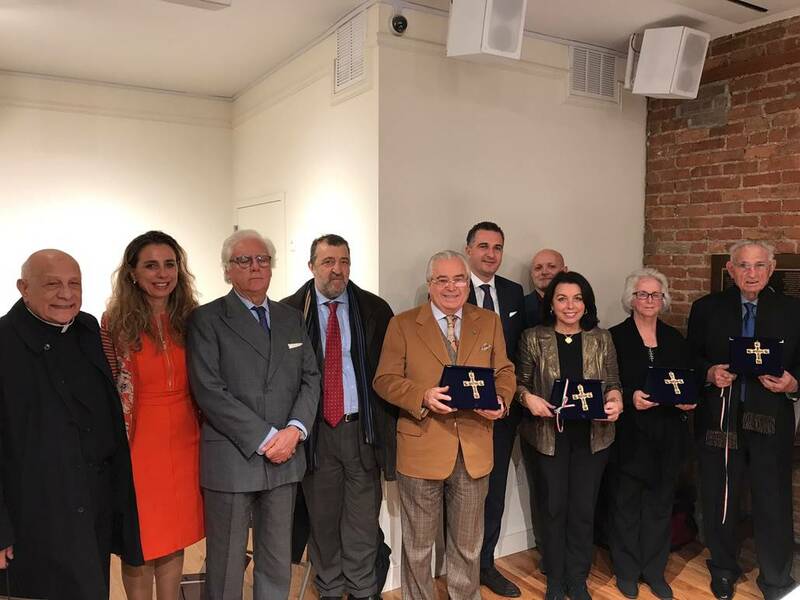 Following the presentations, four Italian Americans were presented with awards from the region of Calabria for their work in promoting the Italian culture. 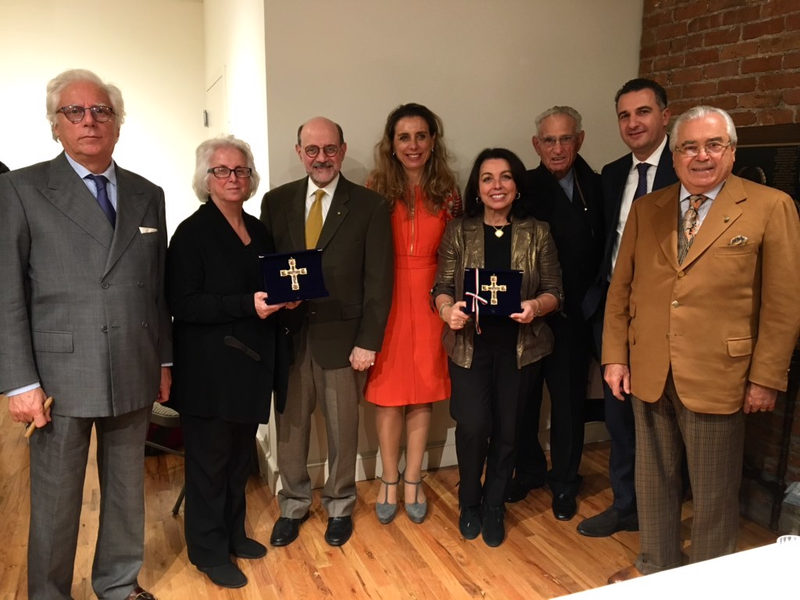 The recipients were Peter Caruso, Anthony Brusco, Elisabetta Calello, and Josephine Maietta.